" WHAT AM I GOING TO WEAR TOMORROW? " AFTER JUNE 26TH YOU WILL NOT NEED TO ASK YOURSELF THAT FOR AWHILE! THE INFAMOUS J.CREW SAMPLE SALE HAS RETURNED FOR THEIR SPRING/SUMMER SEASON. 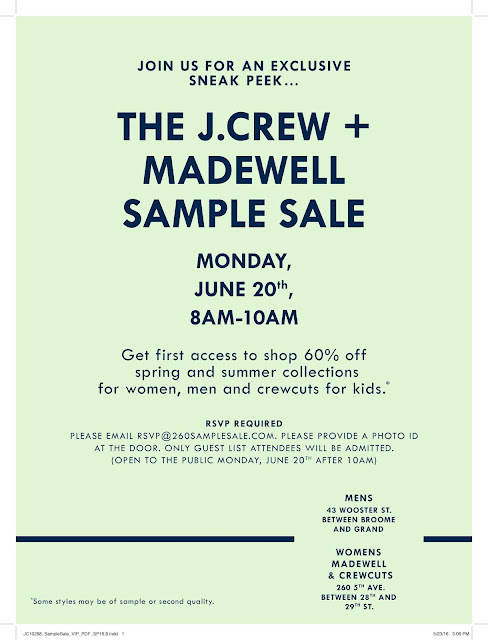 OFFERING WOMENS, MADEWELL, & CREWCUTS AT 260 FIFTH AVENUE LOCATION, AND MENS AT 43 WOOSTER LOCATION IN SOHO. R TRAIN TO CANAL ST.
1 TRAIN TO CANAL ST.